In today’s world, business dynamics and strategy decisions must be centred around the user. The goal is to come closer to meeting users' needs and expectations, constantly improving their experience and, consequently, increasing their satisfaction. In the area of Service Management, being able to offer users an intuitive and easy-to-use web interface is a key advantage. The more confident and satisfied users feel interacting via a user-friendly, intuitive channel like the Customer Portal, the greater the operational advantage and efficiency boost that your IT department, and your company in general, stands to gain in the area of service governance. The HelpdeskAdvanced Customer Portal web-based interface guarantees maximum usability and simplicity for end users, who can benefit from the intuitive and immediate experience of using the portal to open tickets and notifications, consult news and the Knowledge Base, and interact in real time through the Customer Interaction chat tool, Engagent. Published within the Customer Portal is the Service Catalog which gathers all the available services ready to be managed by the IT department and other areas of the company. Navigating intuitively within the Catalog, users can select the services they need simply and rapidly. Service request processes, accessible via the Service Catalog, are automated to respect the flows of service authorisation, management and provision within the established SLAs, and to deliver an enhanced, more effective user experience. HelpdeskAdvanced uses a search engine to support users in finding solutions to their problems and requirements through a typing tool. By consulting the solutions, instructions and previously resolved issues published in the Customer Portal’s Knowledge Base, users can resolve their tickets in self-service mode. The Knowledge Base functionality, collaborative in nature and available round-the-clock, eliminates waiting time for resolving tickets. 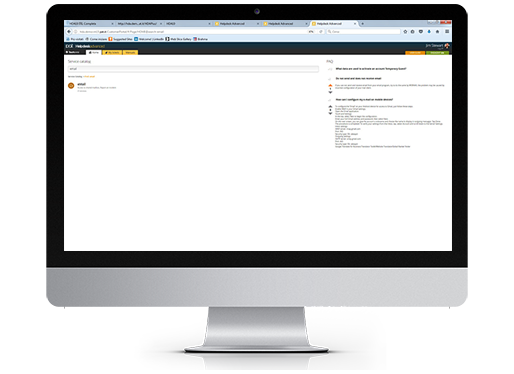 Offer users the most intuitive central channel for service management. Constantly improve user experience, placing users at the heart of your Service Management objectives. Design the Customer Portal for cross-channel interaction with users. Reduce waiting time in managing services by offering users automated processes that are fast and ready-to-use.